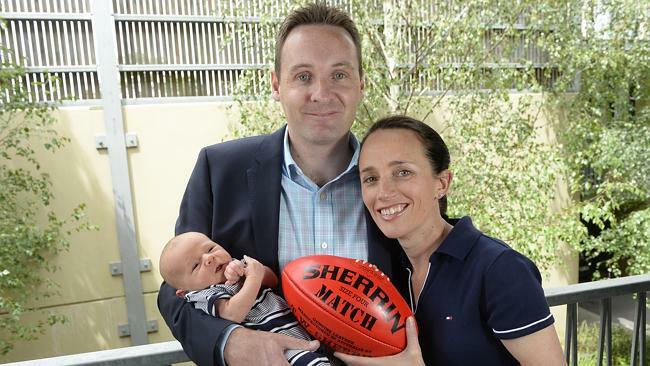 Olympic marathon runner Lisa Weightman, and her husband Lachlan MacArthur, welcomed their first child early this month and have named their son Peter Richard. Peter is named after both his grandfathers, and his middle name is a tribute to Lisa’s coach and mentor, Richard Telford. Lisa has represented Australia in the 2008 and 2012 Olympics, and won bronze at the 2010 Commonwealth Games. She won her first marathon race in 2010 in Japan, and is hoping to compete at the 2016 Olympics. Lachlan is also a runner, and was Lisa’s training partner. Lisa’s father played football for Fitzroy, and her cousin Dale Weightman was an AFL star with Richmond, so everyone is expecting Peter to be a sportsman of some kind too. Former AFL star Gavin Wanganeen, and his wife Pippa, welcomed their daughter Lulu Allegra on November 30. Lulu joins big sister Kitty Emerald, aged 15 months, whose birth was featured on the blog, and Mia and Tex, aged 14 and 11, from Gavin’s previous relationship. NRL footballer Mitch Cornish, and his partner Abbey, welcomed their son Noah on December 9. Mitch plays for the Canberra Raiders. Jockey Matt Paget, and his partner Abbi Dalton, welcomed their daughter Portia on July 31 last year, a sister for Brooklyn, aged 8, and Georgia, aged 7.